It is surprising how many good edible plants are grown purely as ornamentals and their food wasted. When tomatoes were first introduced into the United States, they were widely regarded as poisonous and grown mostly for decorative purposes. The same thing goes for a lot of common ornamental shrubs. All the plants below would happily take a place in the forest garden or allotment, but perhaps in this case you could save some space and just raid the nearest shrubbery. Think of it as urban foraging. Fuchsia magellanica is the hardiest and most widely-grown fuchsia in Britain. It makes a large shrub to 2-3 metres. Here in the north-east the top growth is killed every few years in a hard winter, but the roots always survive and the plants soon recover. The milder west is more to their liking and I have seen them bidding to take over entire hillsides around Mallaig. The flowers are edible, if more for novelty value than taste, and very pretty. I like their Spanish name: pendientes de la reina – the queen’s ear-rings. These days there are many varieties available, but they are usually overblown and gaudy, lacking the elegance and beauty of the original. 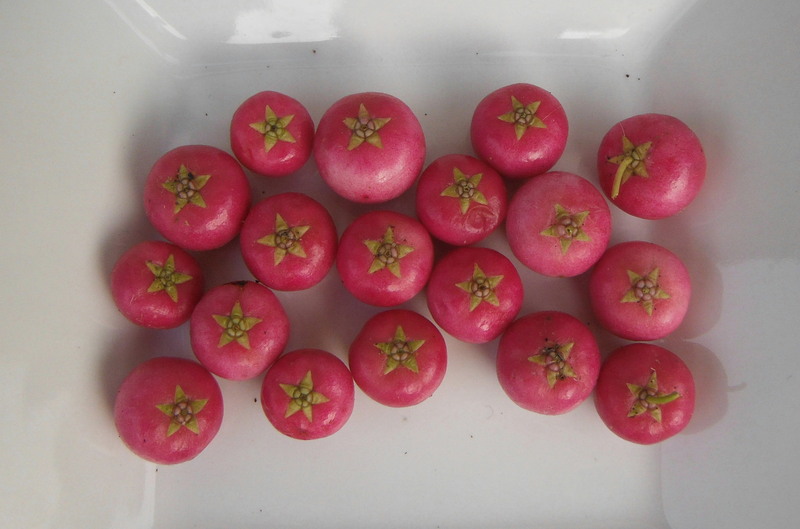 Ripe fuchsia berries are very pleasant with a mild, sweet flavour. The biggest difficulty is picking out the ripe ones: unlike most fruits there is no great colour change, the ripe fruits are simply a little lighter, a little larger and a little softer than the unripe ones. It makes eating fuchsia berries something of an art, because the unripe ones taste horrible and catch at the throat, but you get your eye in after a while. Fuchsia berries are said to vary a lot in taste, although I suspect that some of the more negative descriptions (from ‘peppery’ to ‘petrol’) are the result of eating under-ripe berries rather than a true reflection of the ripe berry’s taste. I now make a point of tasting any fuchsia berry I see. They take extremely easily from cuttings so if you find a particularly nice variety, nip off a branch, put it in water and take it into your own garden (and send me a bit!). Gaultheria is a large genus containing a number of ornamental shrubs. It now contains a number of species which used to be called Pernettya: these were the Southern-hemisphere species but since there was no consistent difference between them and the northerners they have now all been lumped together under Gaultheria. The nicest of them all is probably shallon (G. shallon), which I’ve written about before. The most striking is definitely prickly heath (G. mucronata), with red, white or pink berries that look like they are made out of polystyrene. It is difficult to imagine anything less edible looking, but in fact they are sweet and tasty. My girlfriend suggests that they could be used as healthy cake decorations. Like the fuchsias, Gaultheria species are variable and easy to propagate, so have the potential to be selected for the quality of their fruit. I recently found a variety of shallon with much fleshier berries than usual, so I plan to knock on the owner’s door and ask for some divisions of it some time. Two species of Berberis are widely used as shrubs: B. darwinii (Darwin’s barberry) and B. thunbergii (Japanese barberry). Both have fruit that are too sour to enjoy raw, but B. darwinii berries are very tasty in a jam or jelly. Ciaran Burke gives a jelly recipe on Blooms ‘n’ Food. I think I prefer them as jam but I’m still experimenting. I’ll post a recipe next season. 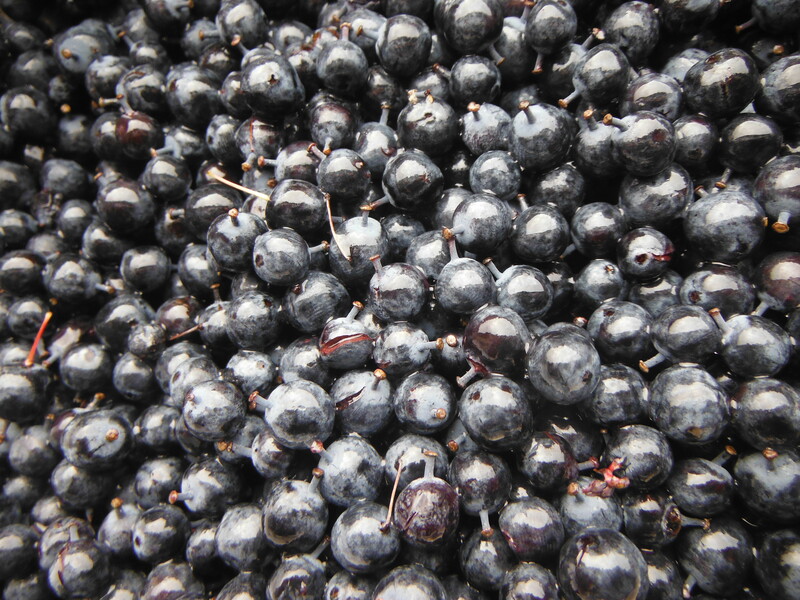 Japanese barberry is less useful, but you can juice the berries to make a lemon juice substitute. The Agroforestry Research Trust describe Korean barberry (B. koreana) as ‘the best edible barberry’ but Plants for a Future give it an edibility rating of 1 out of 5, so who knows? Eleagnus is yet another varied genus of shrubs, including oleaster, silverberry, goumi, autumn olive and even Trebizond date. Mostly they are planted for their silvery, glossy or variegated foliage, but a lot of them have nice edible fruit too. Sadly this can be hard to come by: they need a pollinator and I’m not sure how far now far north they succeed in bearing fruit – I’ve found E. x ebbingei fruit in London but never in Scotland – but I think it’s worth checking out any bush you find. Black chokeberry (A. melanocarpa) is sometimes planted for its stunning autumn foliage, but it’s also a useful berry crop. Best in jellies and jams, it is rich in pectin and helps other fruits to set. The ones in my garden are growing happily and fruiting in a semi-shady position. They eventually grow to about 2.5m. This entry was posted in Species and tagged Aronia melanocarpa, Berberis darwinii, black chokeberry, chokeberry, forest garden, Fuchsia, Fuchsia magellanica, gardening, gaultheria, Gaultheria mucronata, Pernettya, prickly heath, unusual fruits. Bookmark the permalink. Thank you for this article. Unfortunately, this winter AgroRT couldn’t fulfill my shallon order, but this article inspired me to try and obtain some mucronata in the coming year (you need separate male/female plants, unless you go for Bells Seedling, I believe). Further investigation at PFAF got me thinking about procumbens, but when I tasted it at a local garden centre – no thanks! I had recently added darwin’s barberry to my wish list, but then I came across videos on youtube presenting thunbergii as a menace in north american woodlands. My allotment site neighbours woodland and its not a habitat I want to see invaded. There is also a link it seems between thunbergii overgrowth, explosion populations of ticks and lymes disease. I wonder whether certain cultivars of fuchsia have better tasting berries than others. I tried the one in my garden, F. ricartonii but the fruit was quite bland. It’s a young plant, still establishing though. I found berberis darwinii isn’t too bad raw if you leave it to ripen further on the bush but the blackbirds will usually get there first, in that case. I’ve heard that besides making a jam, it is also used as a dried fruit with rice in Iranian cooking. Waheed, I can confirm that the B. darwinni self seeds as mine occasionally has new seedlings nearby and my parent’s garden also had some appear from nowhere, probably spread by birds. I’ve read that Fuchsia magellanica, F globosa, and F regia subsp regia are all tasty varieties. My references are “A Taste of the Unexpected” by Mark Diacono and “Homegrown Revolution” by James Wong. Since F magellanica is the most common garden Fuchsia in the UK this unfortunately doesn’t tell us much as there is plenty of variation within the species. Martin Crawford recommends the cultivar ‘Riccartonii’. I think it’s a great shame there’s no-one out there breeding for flavour in Fuchsias as I’m sure that in such a large genus great things could be achieved. Would anyone be able to suggest a security hedge where the fruit and or leaves are edible. 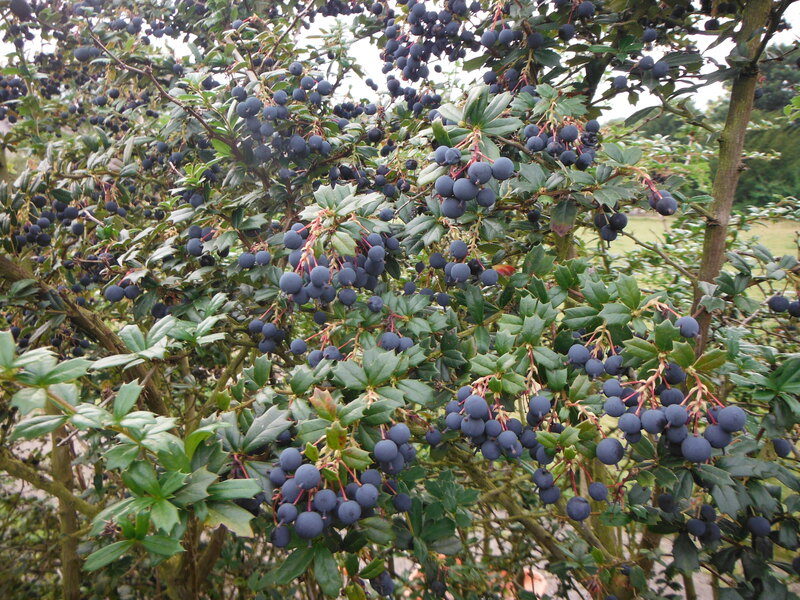 The hedge should be evergreen, about 1.5 – 2.5 meters tall and ideally the fruit should be edible raw. Berberis darwinii and Mahonia aquifolium are both evergreens of about that size ( a little larger actually but they can be trimmed). The fruit of both is quite sour so I wouldn’t eat it raw in great quantities. Gooseberry meets all your criteria except for being evergreen. The trouble with gooseberry is that its leaves are skeletised by sawfly. Barberries of all species are pretty good for acidulating stews and sauces. Iranians in our church use them this way and also serve them cooked and mixed with a little rice as a garnish. They are sold as zhereshk in the shops and are fairly dear in quantity, so we have ordered some plants to grow for them in the garden.